- Publisher This indispensable reference reflects the sweeping changes that have occurred in the way women and men view important issues affecting ethics and morality. The 167 outstanding contributors cover in a clear, concise manner the broad spectrum of topics that concern thinking people everywhere. 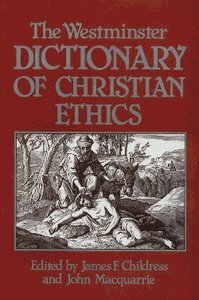 About "The Westminster Dictionary of Christian Ethics"
This indispensable reference reflects the sweeping changes that have occurred in the way women and men view important issues affecting ethics and morality. The 167 outstanding contributors cover in a clear, concise manner the broad spectrum of topics that concern thinking people everywhere. James F. Childress is the Hollingsworth Professor of Ethics and Professor of Medical Education at the University of Virginia in Charlottesville, where he also directs the Institute for Practical Ethics. He is the author of numerous articles and several books in biomedical ethics, including "Practical Reasoning in Bioethics".